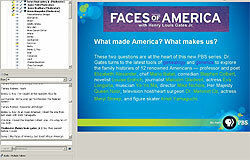 Webinar: PBS & Classroom 2.0 - Exploring the Faces of America with Dr. Henry Louis Gates, Jr.
PBS Teachers and Classroom 2.0 hosted a free interactive webinar for educators on Tuesday, February 23rd. Dr. Henry Louis Gates, Jr. discusses “Faces of America,” and a representative of the Educational and Community Outreach department at THIRTEEN provides an overview of the rich educational resources that have been created to help you use the film with elementary, middle and high school students. To watch the webinar, visit http://www.classroom20.com/events/pbs-cr-20exploring-the-faces.